LONGVIEW — Both teams already knew they were going to the dome, but now the Union Titans will get to feel at home in the dome. 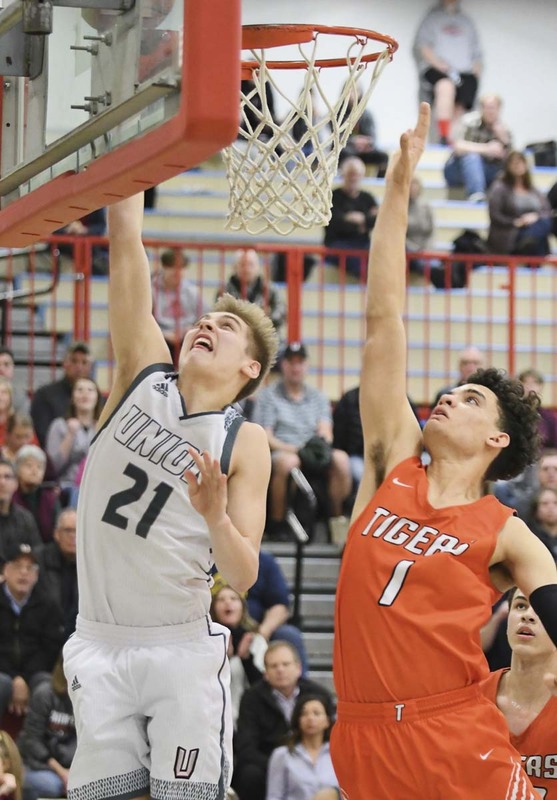 Union topped league-rival Battle Ground for the third time this season, this time beating the Tigers 56-37 in a Class 4A state regional basketball game Friday night at Mark Morris High School. The victory sends the Titans to the state quarterfinals next week at the Tacoma Dome. Battle Ground still goes to the dome, too, but will play in the round-of-12 elimination game. This was one of three regional basketball games featuring Clark County teams on Friday. There are eight more on Saturday, including four games at Battle Ground High School. This is the weekend that qualifies the 4A and 3A boys and girls basketball teams to the Tacoma Dome, and boys and girls 2A and 1A teams to the Yakima SunDome for the final week of the Washington Interscholastic Activities Association state tournaments. After this weekend, all the brackets will be set. Union, No. 1 in the WIAA’s RPI, knows it will be playing at 10:30 a.m. Thursday in the quarterfinals. The Titans (24-1) have done just that with back-to-back victories to earn the bye among the dome teams. Battle Ground will be in familiar territory at the dome, playing for its season. The Tigers went 3-0 in elimination games in the bi-district tournament to get this far, and then had a strong enough RPI to ensure going to the dome regardless of Friday’s result. The Tigers were in the game for a bit, scoring nine in a row to open the second quarter to pull within three points. 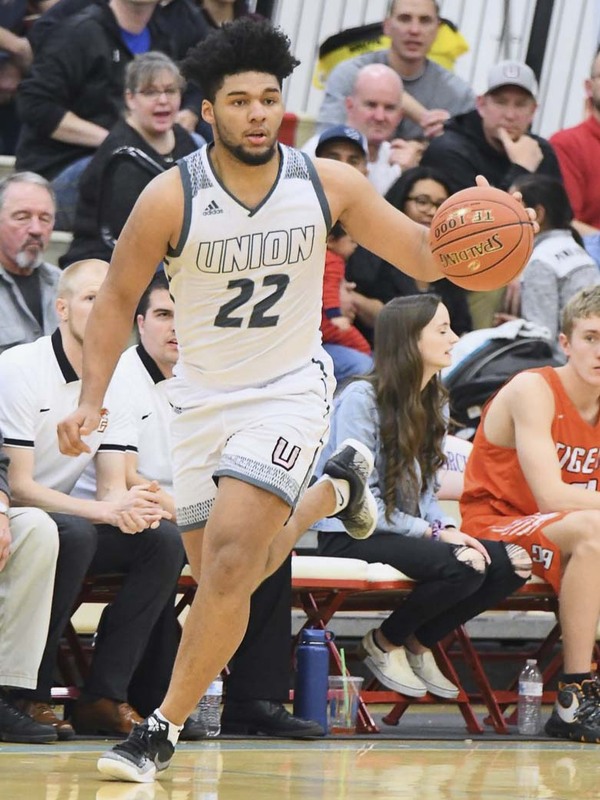 Then Taylor, best known for his football skills after helping Union win the state football title in the fall, showed off his basketball skills. For this game, he was the most important Titan on the floor. That second-quarter run by Battle Ground? Taylor ended it. Then Taylor ignited a Union run that pretty much secured the victory. Union went scoreless for more than four minutes of the second quarter. Taylor ended the drought. The next time down the court, it was another Taylor bucket. Moments later, Taylor got position for an offensive rebound, then did a tip pass out to Brad Lackey at the arc, and Lackey buried the 3-pointer. Ethan Smith put the finishing touches on the 10-0 run with a 3-pointer just before halftime. Union had restored order, up by 13 at the break. Battle Ground never got to within single digits again. Lackey and Tanner Toolson led a balanced attack with 12 points each for the Titans. Smith finished with 11. Taylor had his moments on offense, but he was even better on defense, assigned to play against one of the best players in the state in sophomore Kaden Perry. Taylor had a blocked shot, had three steals, plus he grabbed nine rebounds. Perry finished with 11 points and 11 rebounds to lead the Tigers. He had to work for everything. “I’ve got respect for Kaden. His future is so bright. He’s a warrior for sure,” Taylor said. Union coach Blake Conley confirmed that Taylor was the team’s MVP for the game. The coach also was pleased the defensive effort overall. Union held the Tigers to single-digit scoring in the first three quarters. Of course, for a while there, it was Union that was not scoring. Then Taylor did his thing. “Dream, when he gets a hustle play or a tip-out assist, it’s such a huge momentum swing in our favor,” Conley said, using Taylor’s nickname. It’s been a dream season so far for the Titans. They had a 22-game win streak and now they are going to the dome, assured of playing at least two games. Last year, the squad was knocked out of the elimination game on Wednesday. The team was in Tacoma for just a few hours. “We’re going to get that Tacoma Dome experience other players and coaches have talked about so much,” Conley said. Mt. Spokane 71, Prairie 52: The Falcons saw their 14-game win streak come to an end, playing a long way from home. The season is not over, though. That long win streak jumped the Falcons into the top eight in RPI. Friday’s loss sends Prairie into the round-of-12 elimination game Wednesday at the Tacoma Dome. Prairie will play at 5:30 p.m. Wednesday. The Falcons will need a win to advance to the quarterfinals. Medical Lake 42, King’s Way Christian 31: King’s Way Christian saw its championship season come to an end with an 11-point loss in Spokane. The Knights won the Trico League title this season and fell one win short of reaching the Yakima Valley SunDome. Still, it goes as a state tournament appearance for the Knights, the first for the program.